Being neither Mexican nor Jewish, I imagine I’m the perfect audience for the chaotically cross-cultural ethnography farce of My Mexican Shivah. The clutter begins with the film’s very title. Original Mexican: Morirse Está en Hebreo, which is then translated to Hebrew and then, via subtitles, to the Spanish-as-a-second-language gag Se Habla Yiddish. In other words, get ready for a whole lot of mixed messages and crossed signifiers. 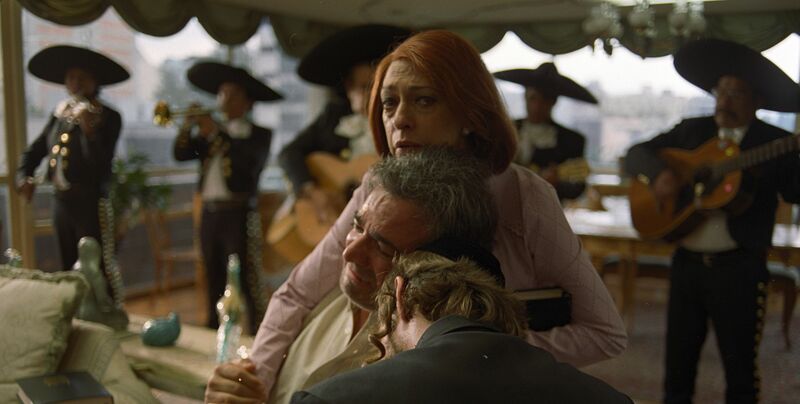 Like the plate on which meat and dairy accidentally mingle, My Mexican Shivah is a cluster—a Latino Mike Leigh by way of Sidney Lumet—and one is often struck with the urge to just sweep the whole family platter into the dustbin. Moishe (Sergio Kleiner) is the moderately estranged family patriarch who, in the film’s pre-credits sequence, drops dead while celebrating with his theater friends. The rest of the movie details the seven days of the shivah (in layman’s terms, an extended wake which continues for a week following the burial of the deceased) and the psychological mindfuckery that ensues among Moishe’s relatives and closest friends. Moishe’s sour daughter Esther (Raquel Pankowsky) lashes out at everyone who disrupts the piety of the event, packs a knife in case her late father’s home-wrecking shiksa lover dares to show her face at the shivah, and accuses her own daughter of schtupping a black man in New York. Moishe’s pasty son tries to secure an abortion for his own side girl and deals with a son who, thanks to the dead abuelo, has been engaging in some shady dealings in the Holy Land. And then there are the old shits who come to blows with each other over who is more Jewish. The roundelay of secret sins and all-too-public grievances between those purported to be in mourning would be improper enough by themselves, but watching over the entire mess are Moishe’s two angels (one good and one dark, though they both look identical to my gentile eyes), invisible to the clan but always there to take stock of their mark’s cosmic score. The implications of My Mexican Shivah are that we are judged by the actions and attitudes of those closest to us. In practice, though, familia is a burden to bear even long after death.